After shouting encouragement to his runners, Wakeland girls cross country coach Braegan Enright’s voice was fading Saturday afternoon at Old Settlers Park in Round Rock. But the pride still shined through in his gravelly words. “All the girls just really ran well today,” he said. That’s why the Wakeland girls are now the University Interscholastic League (UIL) 5A state champions. 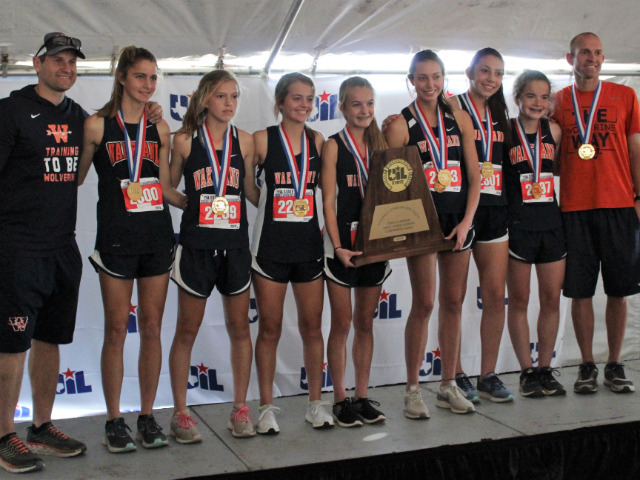 The state title gives Frisco ISD three 5A cross country championships in the last four seasons, joining the Wakeland boys title in 2015 and the Liberty girls title a year ago. Frisco High also won a 3A boys cross country title in 1982. Two Wakeland runners received medals for finishing in the top 10 overall: senior Isabella West (fourth) and freshman Chloe Smith (10th). Frisco ISD’s top individual girls finisher was Reedy sophomore Colleen Stegmann, who was third. The Wakeland boys also had a strong finish to the season, placing 10th in the team standings. Wakeland senior Nick Hendrix was FISD’s top finisher, finishing 13th. Enright and Wakeland boys coach Marty Tidwell, who work together each year to build their teams, had huge smiles after the awards ceremony. FISD Athletic Director David Kuykendall was watching the live standings board, and when he saw Wakeland had won, he gave the news to Tidwell.